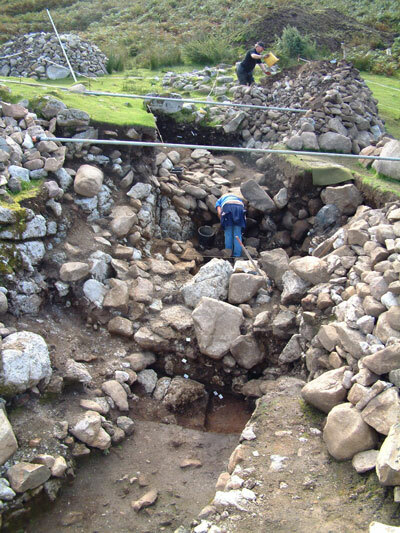 With the 2009 fieldwork seasons now finished at the High Pasture Cave and Fiskavaig Rock Shelter sites in Skye, it is back to the computer to prepare the site archive, drawings and reports. It has been another excellent season at both sites and I would first of all like to say a big thank you to the volunteers who have assisted with our work during 2009. We have also received over a thousand recorded visits to the High Pasture Cave site this year - so thank you for taking time to have a look around and for supporting the project. 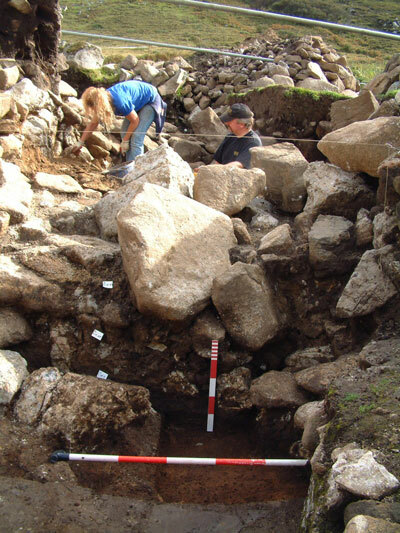 With the generous support from our major sponsors including Historic Scotland, we will be undertaking one final year of excavations at the High Pasture Cave site in 2010. 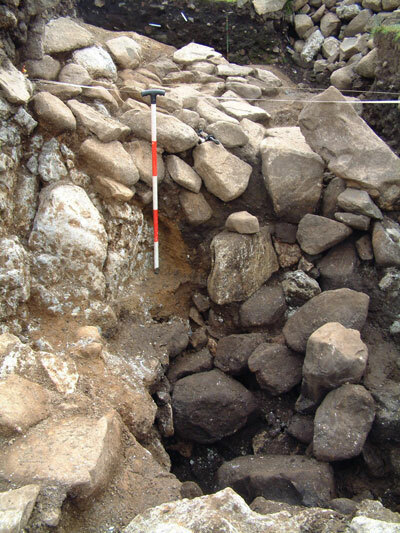 The complex nature of the archaeological deposits uncovered during the 2009 season, along with the effort required to move some large prehistoric backfill material, impacted on our proposed fieldwork. In effect, we just ran out of time in 2009. Therefore, we will be completing excavations around the head of the stairwell and within the burnt mound/spreads, while also completing the survey of the wider prehistoric landscape and sampling of some of these sites. Therefore, if you would like to join the project team for the 2010 season as a volunteer, we have a few places left (see the Home Page for details). The image above shows the lower walkway leading away from the natural entrance to High Pasture Cave. 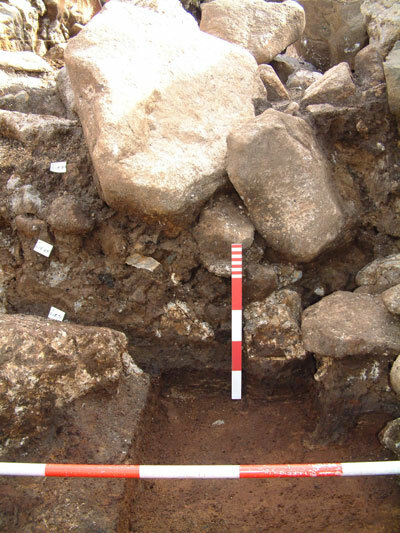 The walkway had been backfilled with midden deposits, fire-cracked stone and boulders - which also contained some rather nice saddle querns (complete and fragments) and quern rubbers. Some of the backfill deposits are still visible within the walkway and these can be seen in more detail in the image below. Beyond the backfill in the walkway, moving away from the cave entrance towards the east, we uncovered further paving at a higher level. However, the area here appeared badly disturbed. In fact, the paving appeared to be subsiding into an hidden feature below the walkway; and after removing a significant amount of boulders and sediments we uncovered a new cave entrance. In the image above, George can be seen standing in the backfilled cave entrance (backfill deposits shown in the foreground between the lower and upper walkways). Steph is excavating the archaeological deposits abutting a natural and vertical limestone cliff face, and it is into this face that the cave entrance had been formed. By the end of fieldwork in October, we had managed to secure the upper part of the new cave entrance. However, large boulders and sediment deposits still require removal next season before we can gain entry into the descending passage beyond. The image above shows the upper paved walkway, and has it runs towards the camera position it has subsided into the hidden cave entrance. We recovered a fragment of a granite saddle quern from the upper deposits in the cave entrance, but we will have to await next years excavations to see if this cave was utilised in a similar manner to Bone Passage in High Pasture Cave.